Nostalgia is the focus of Disney's new live action Christopher Robin, which imagines the titular character's drab adulthood after leaving behind the Hundred Acre Wood and his beloved friends, Winnie the Pooh, Tigger, Piglet, Eeyore, Rabbit, Kanga, Roo, and Owl. 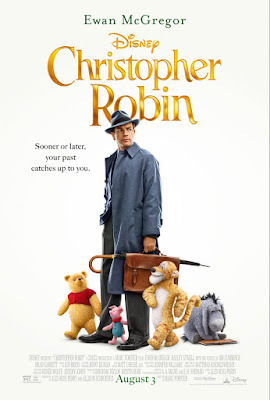 Taking its cues from Steven Spielberg's Hook, Christopher Robin finds Robin (Ewan McGregor) toiling away as a middle manager for a luggage company in the days after World War I, his life now devoid of the magic and wonder it once held for him as a child. When his boss forces him to forgo a vacation with his wife and daughter in order to come up with a plan to save the struggling company, Robin begins to despair. That is until Winnie the Pooh (Jim Cummings) shows up to ask Robin to return with him to the Hundred Acre Wood to help find his missing pals. Resistant at first, Robin soon finds himself on a glorious adventure back to his childhood, reuniting him with his friends and reminding him what life is all about in the first place. As Christopher Robin whisks its hero back to his childhood, so too does it transport the audience to a simpler time. Fans of Winnie the Pooh will find quite a bit to love here, from Cummings' lovely performance as Pooh, a role he's been playing in animated Disney films for decades, to Brad Garrett's wonderfully droll Eeyore. The score by Geoff Zanelli and Jon Brion pays loving homage to the classic original songs by the Sherman Brothers from The Many Adventures of Winnie the Pooh (Richard M. Sherman also penned 3 new songs for the film), setting the film firmly in the world audiences have grown to know and love for generations. 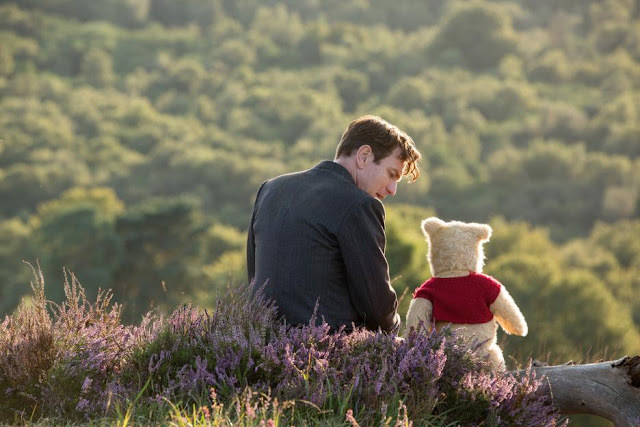 On the other hand, the screenplay by Alex Ross Perry, Tom McCarthy, and Allison Schroeder plays it just a little too safe, never acknowledging what the original film seemed to make quite clear - that Pooh and the gang are stuffed animals that only come to life in Christopher Robin's imagination. In doing so, it seems to miss a perfect opportunity to explore Robin's relationship to his childhood, and reawakening the fantasy and wonder that stems from the imagination. Instead, it goes for a rather familiar plot line that borrows liberally from Hook and even Disney's own Mary Poppins (which is about to get its own belated sequel in the form of Mary Poppins Returns this December). Still, the screenplay features many charming moments, sensitively directed by Marc Forster (Finding Neverland), a filmmaker who is no stranger to the nostalgic weepie. It is somehow fitting, given that the original Many Adventures of Winnie the Pooh was an episodic adventure that featured no overarching plot (it was mostly stitched together from previously released short films). Perry, McCarthy, and Schroeder allow the relationship between Pooh and Christopher Robin to take center stage, and Cummings gamely steals the show as the ever-hungry "silly old bear." His scenes with Christopher Robin, especially in their escapades through London, are the beating heart of the film, both warmly funny and disarmingly moving. There's something hauntingly elegiac about Christopher Robin, almost if it is somehow as much about putting aside childish things as it is about recapturing one's childhood. In the end, it's really about finding a balance between the two, but there are moments, especially in the first half of the film, that feel almost transcendent in their gossamer beauty. 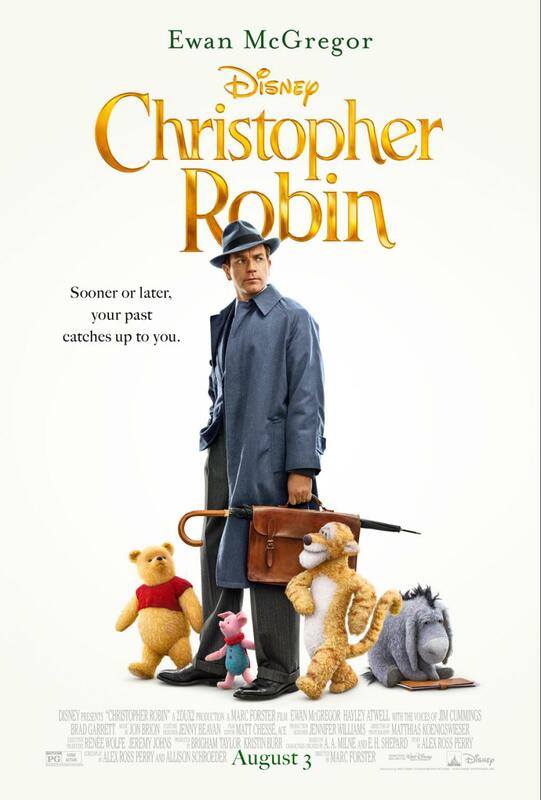 It may not reach the heights of the other cute stuffed bear that came out this year (Paddington 2), but its warmhearted embrace of its classic characters and their importance in the lives of so many elevates it above last year's Goodbye, Christopher Robin, which offered a much darker take on the story of the real-life Christopher Robin. Time spent in the company of Pooh is never wasted, and Christopher Robin isn't perfect, it is nevertheless a welcome and beguiling return to the world of the Hundred Acre Wood. CHRISTOPHER ROBIN | Directed by Marc Forster | Stars Ewan McGregor, Hayley Atwell, Mark Gatiss, Jim Cummings, Nick Mohammed, Peter Capaldi, Brad Garrett, Bronte Carmichael, Sophie Okonedo, Toby Jones | Rated PG for some action | Opens today, 8/3, in theaters everywhere.